As anyone who’s both played The Division and been to New York can instantly recognise, the developers did a pretty good job nailing the look and feel of the city’s streets. 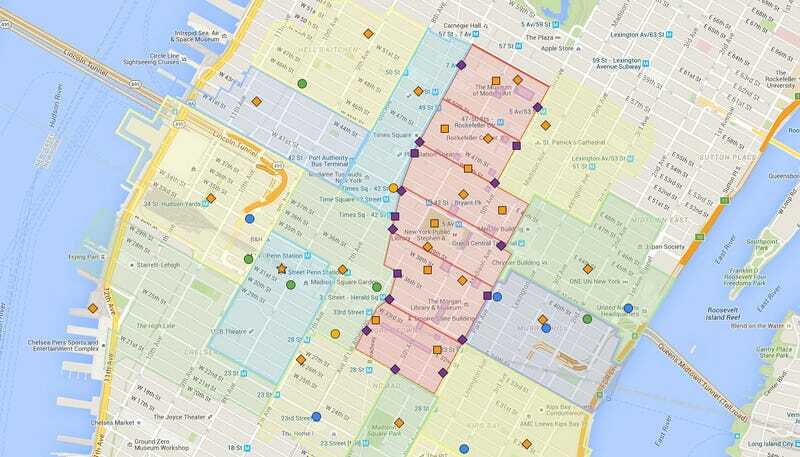 Which is cool for tourists and residents, but what about cartographers? For those concerned with the accuracy of the game’s map (and mission placement upon it), Feanauro (via PC Gamer) has done his best to recreate things from a top-down perspective, building a custom Google Map that lays stuff like story missions and safehouse locations over the actual Manhattan. The game makes some simplifications from rl NYC (for instance, some streets do not exist in game) which create some inconsistencies or visual anomalies (like, the aspect ratio of some DZ landmarks seem unnatural). For this reason, I didn’t attempt to reproduce the DZ border in game faithfully with all its nooks and crannies, just closely enough to correspond to the major streets.